A good friend of mine has just died. 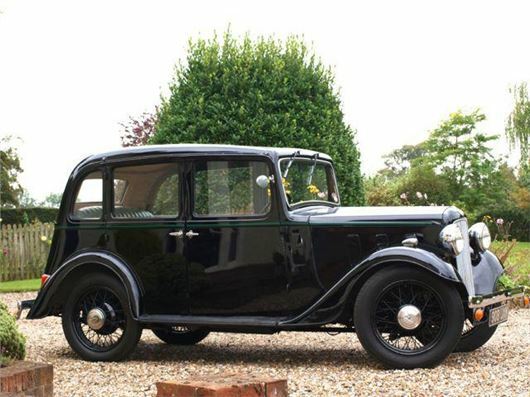 14 months ago he purchased a 1936 Austin 10 'Sherbourne'. I believe he paid about £7,000 for it, which I thought was a lot of money. It’s in very good original condition and runs well. What do you consider it might be worth? I have seen one on sale on an Internet auction reach £4,000. But the way to deal with this is to enter it for a physical classic car auction. If you do it now you're probably not too late for the relatively convenient Anglia Car Auctions sale at King's Lynn on 27th August http://www.angliacarauctions.co.uk/en/home/ Alternatively, Historics Sale at Brooklands on 20th August. http://www.historics.co.uk/ After inspecting the car they will tell you what they think it will fetch. This is the best way to handle a bereavement sale anyway because then none of the administrators can be accused of gaining an advantage. Cars like this earn a living as props in period movies and TV dramas. Could you please explain the difference between turbocharging and supercharging and what advantage, if any, has either method of boosting engine power over the other? A supercharger is a fuel/air compressor driven by belts or gearing and uses some engine power to boost engine power. A turbo is a compressor driven by exhaust gasses turning a turbine fan so doesn't used power to boost power. The difference used to be that a supercharger boosted power from very low revs all the way through the rev range, whereas a turbo would not be effective below 2,000rpm, but the latest turbo management employs turbos from as little as 1,200rpm. Very few cars are now supercharged. Even Mercedes Benz and VAG have abandoned them. Money mountain or money pit? Will the Aston Martin V8 Roadster become depreciation free? Eventually, yes. The value of money will continue to fall against the value of collectible assets. Over the last 10 years the value of Sterling has fallen by more than 300% against property, art and collectible cars. Unfortunately, Aston Martins will never become maintenance free. Just want know the true mpg in your web how did come up? Did you tried it yourself or just people done it? Our website runs Real MPG, not 'True MPG'. All our figures are averages from more than 105,000 submitted by real drivers driving real cars on real roads, with some clever algorithms included to prevent cheating. I am considering an early BMW E92 coupe (ballpark 2007-2008, 75k miles, £6,500). Of the petrols (I don't do enough miles for diesel to make sense), it seems the 3.0 is the peach, but is the 2.0 litre petrol really as bad as owners’ forums say it is (unrefined and unreliable)? And should auto with the 2.0 be out of the question, or is it worthy? Grateful for your thoughts. Beautiful car. The 2.0 litre is four cylinder, not six like it used to be. Not very powerful. Timing chain problems. Bogged down by auto. The 3.0 litre 325i E92 was 6-cylinder. Smooth, but not quick. Better the 330i or 335i. The 335i is a 160mph car. I've done it in several. Prefer the 335i to the E92 M3, but early automatics had peculiar shifters on the steering wheel. My otherwise sound 2002 Mercedes CDI is rusting quite badly at the doors and wheel arches. It's only done 70,000 miles and is kept in a dry garage. At what point will rusting cause it to fail its MOT? When the rust becomes structural. The same problem affects most Mercedes from A Class to S Class from 1997 to 2003 due to cost cutting in the way the car bodies were prepared for painting. For some time now I have been using a local car wash that uses a combination of hand and jet washing. I have recently been told that it is not advisable to jet wash the tyre walls as this causes damage. Is this true? Depends what's in the jetwash. If there's any acid in it then yes. If it's just water, then no. I have a £300 amount of monthly money available. Would it be better to buy a car on hire purchase or to lease a car say for 24 months? £300 x 24 makes £7,200, which might buy a basic new Dacia Sandero on HP over 24 months, or a used car. £300 a month will get you a better car on a Personal Contract Purchase, but will mean having to fork out a pre-agreed sum at the end of the contract to keep the car. £300 a month will get a much better new car on a lease but leave you with nothing at the end after 24 months. With just 200 miles on the clock of my new X5 M-Sport, I've kerbed one of the rear 20-inch diamond cut alloys. BMW’s bodyshop does not repair them as they have had some questionable quality repairs. They suggest a new wheel costing £730 + VAT. A specialist alloy wheel repairer has quoted £150 for a repair that will take 2 days to complete. They say the repair will be as good as new, but BMW’s body shop has made me wonder if I should bother. They say it is very unlikely the wheel will repair well. What would you advise? Have you had any reviews on this type of repair? Can you suggest where a new genuine BMW wheel could be had at a better price? A friend of mine, with children in the car, was in collision with another car on a road with a 60mph limit, although the road itself is narrow has many bends and is in places, unsuitable for speeds above 25mph. The car, whose driver was 17 and had recently passed her test, accepted that she was driving too fast for the road conditions. However, she has now been advised not to admit anything. There were no witnesses to the collision. The young persons car had a telematics black box fitted, which I assume would have details of the speed, use of brakes etc. Can the black box be used by both insurance companies to decide who was at fault or at least who was less to blame, or will it end up as knock for knock? Yes, though it depends on clear GPS signals, the data in the black box is evidential. It has been used by police to secure convictions in the past. You can get a county court order against the driver and her insurer for the protected data to be provided to you. You need to do this immediately. If the data has been wiped, you then have a case that evidence that is the basis of the young person's insurance has been deliberately destroyed, and, without that black box data, the young person was, in fact, uninsured. Good luck. My 2014 VW Tiguan 2.0 TDi 140 Match Automatic recently had the (recall) defeat software upgrade. Apparently, this incorporated an "enhanced fuel injection pattern.” Whilst the engine performs well and accelerates smoothly, it has developed a significant clatter under load at speeds up to 40mph/1,600rpm, even after operating at full temperature for many miles. My local VW dealers responded promptly when I queried this and have since been in touch to say that VW will be supplying a software "patch" for the problem. Do you have any information or advice about this? The obvious reason for the noise is that it's no longer fuelling sufficiently at low revs to give the necessary torque to run smoothly at those revs. It might run better on Shell V-Power Nitro Plus diesel because that is higher cetane, giving more torque at low rpm. But you have put your finger on a potential problem with the VAG NOx software fix. I have owned a 1993 Nissan Sunny hatchback 1.4 for 10 years. It came with 21,000 miles, has now done 151,000 miles and has been a very good car. It has never let me down, does 50 mpg and has needed very little doing to it. The majority of MoT work has been welding, which seems to be its Achilles heel. But it is now becoming harder to get parts. Also my wife nags me about getting a newer car, especially one with air conditioning (for her travelling comfort). I had been thinking about a Mk1 Focus, as I like the look of them, and the local scrap man recommends them. My budget is a miximun of £1000 (I could pay more, but I am mean, and don’t see the point.) I checked out a Focus but those whopping 195/65 R15 tyres are going to be expensive to replace and one of the things that I hadn't appreciated is how much cars have grown in size. Even a so-called super-minis might be quite adequate for me, as the vast majority of the time I am on my own, so I will have a look at Corsas and Fiestas etc. as well. In that case, at your budget level, check out a Toyota Yaris 1999 - 2005, preferably a 1.3. With a few duff, worn-out exceptions, they are generally the best, most reliable small cars in your price range. I bought an Audi A3 Sportback Sport 1.4TSI in March 2015. I included a few options, which lifted the list price to £24,500. I negotiated a discount and that meant I actually paid £21,600. I went back to the same Audi dealer on Monday, to enquire about the new Q2 and asked for a valuation on the A3. It is "mint" with 6,900 miles. They valued it at £14,500. I was shocked. I then went to a local VW dealer to view a new Tiguan. To my surprise, not only did they value my car at the same as the Audi dealer, they knew, to the penny, what I paid for it. When I said I thought the price was higher than £21,600, The sales guy said, and I quote "as part of VAG, I can bring up all the details of your car,” which he then proceeded to do, on another computer screen, by entering my reg number. What happened to data protection? Can I be certain £14,500 is a true value of my car? Can any dealer find out what I paid for my car? Did the Audi dealer enter my data into an industry wide database for all to see? That's nothing to do with data protection. The VAG group is entitled to record all details of all sales and maintenance history of all of its cars. It's not "your" data. It's their's. However, £14,500 is only the value that VAG puts on your car. You might get more from webuyanycar.com. Our system says £15,750: honestjohn.co.uk/used-prices/Audi/A3/?q=1.4+15+reg+Hatchback/ Remember, whatever car you buy, it almost invariably loses the most value in its first year and, though it continues to drop, it amortises over the years so the annual drop in value becomes less.